Is A Disaster On Its Way? There is nothing like the pressing concern of an immediate pending natural disaster (in this case the spring flooding) to get people in the mind-set of preparing. The national news is currently focused on the flooding devastation occurring across South Dakota, Nebraska, and beyond. Southern Minnesota is starting to see flooding and the similar life-altering disruptions that often occur after record snowfalls, rain, and a warm-up. It all happened in a relatively short amount of time too. We went from sub-zero mega snow storms to sunshine and temperatures that are rapidly melting snow in the matter of about a week. It has now been 10-years since the record floods of 2009. Over that time the Red River has been, for the most part, cooperative in staying below threatening flood levels. Much has been done in the last decade to better protect the City of Moorhead and the neighboring community of Fargo. Work on the diversion is again progressing, although it may be another six to seven years for it to be fully completed. There are also many communities downstream along the Red to the north, and into Canada that are facing a similar threat of devasting flooding. These communities are at varying levels of protection. Over the course of time, absent of the threat and projections of record flooding, it is safe to say many have been lulled into a sense of complacency. Combined with our human nature that often leans toward a bit of denial, wishful hoping, and praying that the flooding won’t be too bad, and that means many are not as prepared as they should be for the flood waters to overtake their homes and businesses. There are a lot of good people on the watch, planning and preparing to do what can be done if the waters rise above current and contingency protection. Unfortunately, there is a lot the majority of us cannot control related to the rise of the water. However, there is also much we can do to prepare ourselves, families, employees, etc. for flooding or any other disaster. I want to turn you attention to a resource created to further remind us what can happen, promote the importance of preparedness, and provide some tools and resources for you to prepare your business, and family for that really bad day. In addition to bringing your attention once again to the www.stayopenforbiz.org website as a tool for preparing, I also wanted to use this opportunity to share the video from our second presenter from the January 17th event: “Emergency: Finding Your Nonprofit's Role in a Crisis”. 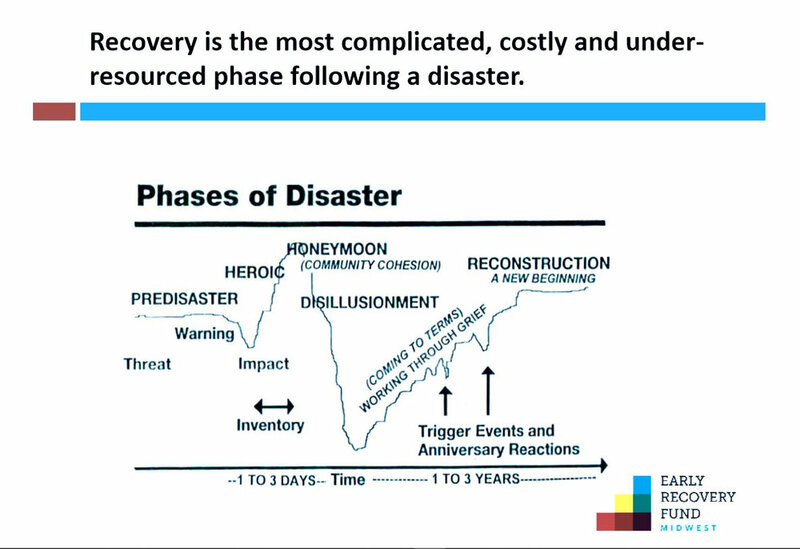 In this newest video release, Nancy Beers from the Center for Disaster Philanthropy talks about the post disaster phases of a disaster: Recovery and Long Term Recovery. Older PostWhat Happens When Disaster Strikes?